These roasted potatoes are so pretty, and they taste fantastic too. All you need is a few ingredients such as yellow potatoes, rosemary, garlic, and olive oil. 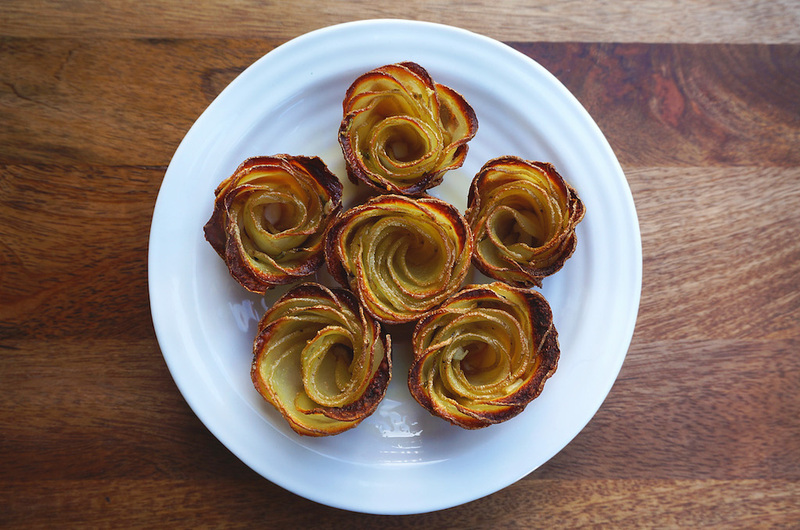 These rose shaped potatoes are crunchy on the outside, and the flesh remains soft, and they are simply delicious. Make the flavoured oil: Lightly pound garlic, rosemary, sea salt in a pestle mortar. Transfer the herb into a bowl and add some olive oil. Set aside. Preheat the oven to 400˚F. Lightly brush the small muffin tray with the flavoured oil. Slice the tip of the potato off. Cut the potato into half. Use a Mandoline, thinly slice the potatoes, make sure it’s not too thin but still flexible. Then layer the potato slices, overlapping each other (about 12 to 14 slices). Roll up the potatoes and place it in the muffin tray. Repeat the process with remainder potatoes. Brush all the potatoes with flavoured oil. Top with a little butter and bake in the oven for about 30 to 40 minutes or until fully cooked and crispy on the outside. Makes 12 small rose potatoes.